Multijet tubular reactors are used to manufacture polymers such as polyester. The turbulent flow that occurs in this type of reactor can affect the manufacturing process, including the reaction kinetics, fiber quality, conversion, and yield. 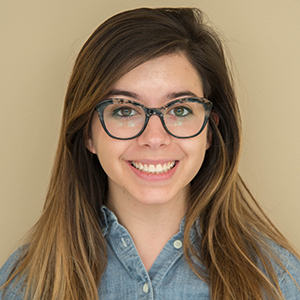 By developing a reactor model that fully takes into account both the fluid dynamics and chemical reactions, you can optimize a reactor design for efficient and reliable polymer production. Within these two categories, polyester has a wide range of applications, such as clothing (polyester leisure suits, anyone? ), bedding, and furniture upholstery as well as industrial fibers, seat belts, and car tire reinforcements. Polyester has even been used to build houses. In the late 1960s, Futuro houses were developed from a polyester plastic reinforced by fiberglass. The houses resembled flying saucers from classic science fiction movies (intentionally or not) and were easy to build and maintain. Although the Futuro never caught on with consumers (less than 100 were made), the use of innovative building materials sure did! 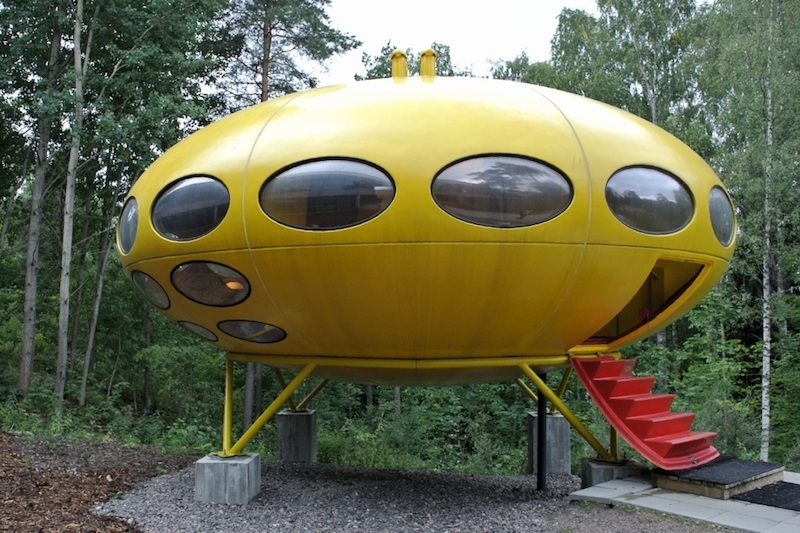 A Futuro house in Finland, made partly from polyester materials. Image by J-P Kärnä — Own work. Licensed under CC BY-SA 3.0, via Wikimedia Commons. One way that polyester is manufactured is through the process of polymerization. Polymerization is often facilitated through the use of multijet tubular reactors. The design of a tubular reactor depends on the intended use of the polyester material and also affects the quality of the synthesized product. 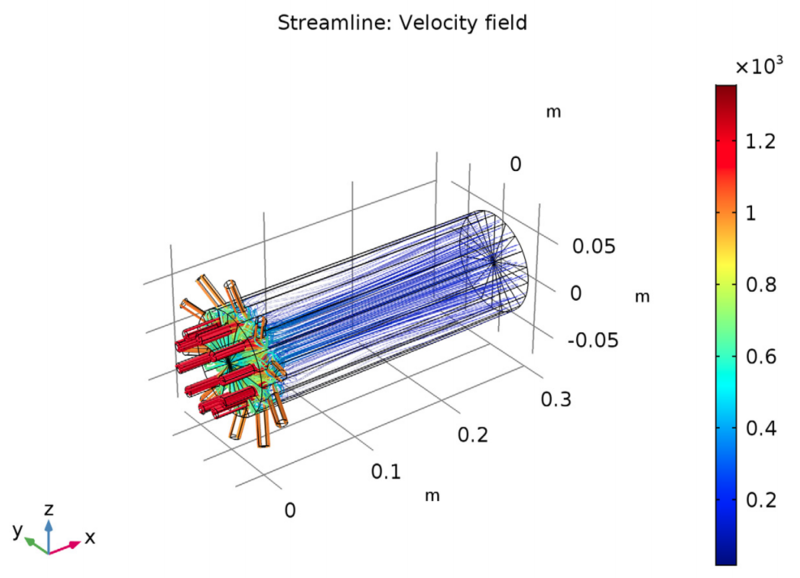 A multijet tubular reactor modeled in the COMSOL® software. 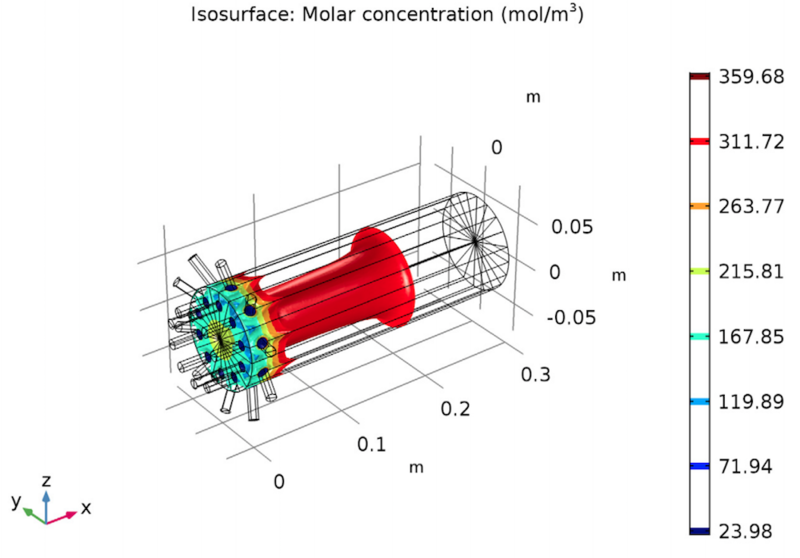 By analyzing the design of a multijet tubular reactor with the Chemical Reaction Engineering Module, an add-on to the COMSOL Multiphysics® software, we can ensure an optimized polymerization process for polyester production. 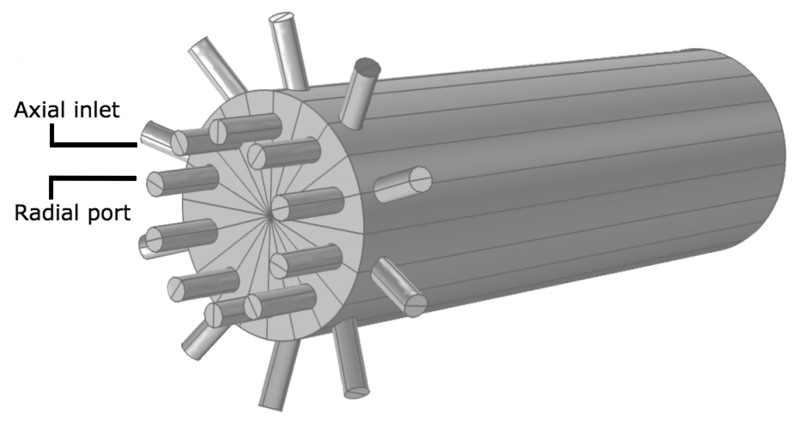 The multijet tubular reactor includes axial inlets and radial ports, into which two reacting monomers enter, respectively. The model geometry for the reactor is shown below. The reaction rates are determined by the laws of mass action and the eddy dissipation concept (EDC) model. 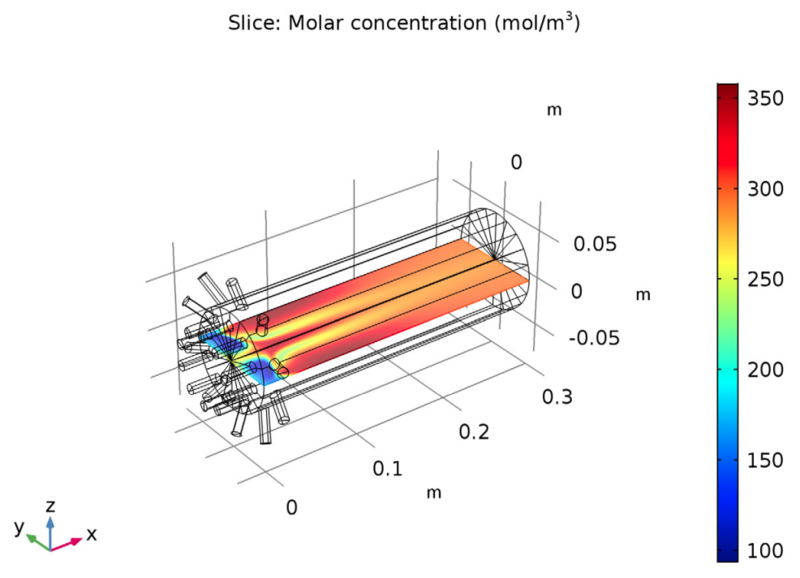 This model extends the eddy dissipation turbulent-chemistry reaction model by including more comprehensive chemical mechanisms in turbulent flows. In addition, sector symmetry and extruded mesh are used to further conserve computational resources. Sector symmetry makes it so you only have to model 1/20th of the reactor geometry. Using a simple extruded mesh saves time and memory on meshing in areas of the model where you expect the flow profile to be uniform. 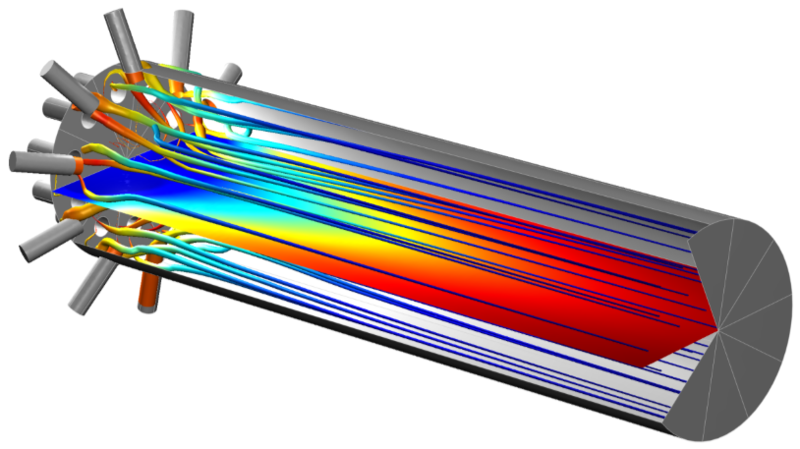 An extruded mesh can save computational time and memory when modeling turbulent flow in a reactor. 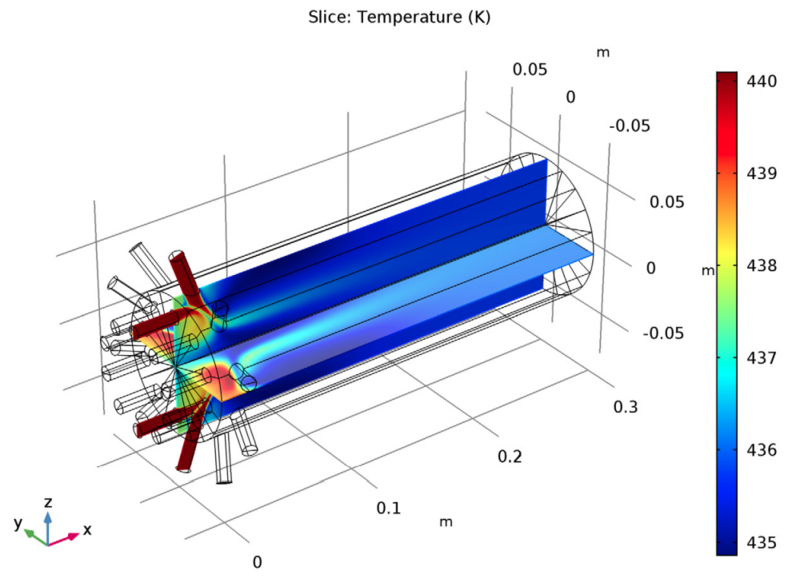 By simulating a multijet tubular reactor, engineers can gain insight into how a reactor’s design affects the polymerization process for polyester production. For instance, the isosurfaces for the polymer linage show where the inlet streams mix. You can see that the azimuthal concentration gradients quickly increase with the axial position, which implies that the inlet streams are well mixed 5 cm down the reactor, an optimal place for the reaction to take place. The results also show that the concentration of the polyester linkage is relatively low in the recirculation zones of the reactor. An increase in the concentration of the linkage could lead to significant changes in the reacting fluid. In particular, the viscosity of the reacting fluid could change, causing undesirable reactions or failure in the reactor. Polymer linkage concentration in the reactor (left) and the velocity of the flow in the reactor with streamlines showing the recirculation zones (right). The results from the chemical model of the reactor also show that the total condensation chemistry for the process is endothermic. From this, you can draw an important conclusion: Endothermic reactions efficiently cool down the reacting flow, which implies that the reactor can easily be kept cool for safe and reliable operation. Try it yourself: Download the Polymerization in a Multijet Tubular Reactor model by clicking the button below. Note that you need a COMSOL Access account and valid software license to access the MPH-file.